Well Autumn is pretty much over, but I wanted to go through some of my favorites that I cannot live without this season! I feel like a lot of the time I will just wear the same thing with a few different shoes or sweaters and it gives it a whole new look! 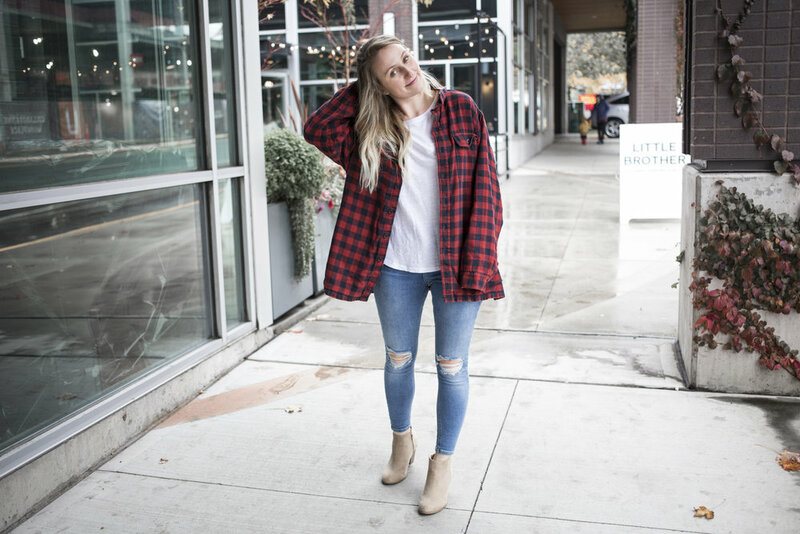 Below are some of my favorite outfits and pieces that I have been wearing this Autumn! I am also all about the flannel! I actually stole this one from my Fiancee, who got it from his grandfather, so it's actually quite a special piece. My shirt I bought at H&M about a month ago, it goes with everything! Everyone needs a basic white shirt. My booties I bought earlier this year at Old Navy, for $13! When they have their sales, they have great sales! I have also had a really hard time finding a denim jacket that fit me right. There are so many styles, cropped, oversized, fleece lined, biker. I had one that I liked but it wasn't very structured, and I wanted to look crisp! I found this one at Forever 21 and I actually really like it. It's a bit oversized but It was perfect for layering. I liked to put it with my turtleneck and let the collars battle it out! This sweater, I am OBSESSED WITH. It goes with everything, and I am honestly surprised I haven't spilled on it yet. I love love love that it is long and slouchy, and it's a v-neck too! I am loving this trend lately, I hate sweaters that choke you and are all scratchy! Not sure if you can see it in this photo but there will be more later but I am also loving these gold bar necklaces that are trending! I know its super basic but who cares I love simple things like that and it goes with everything. I'm also pulling a bit of a festival vibe with my heart sunnies! All items linked below! I bought this skirt like a year ago and never wore it! I also take any excuse to wear my hunter boots as I can, they make any outfit better! And again, I love anything flannel so this skirt was a no brainer for me! I also really wanted to find ways to incorporate sunhats into fall wear so I get my moneys worth! I've been doing that a bit this season, you will see more! 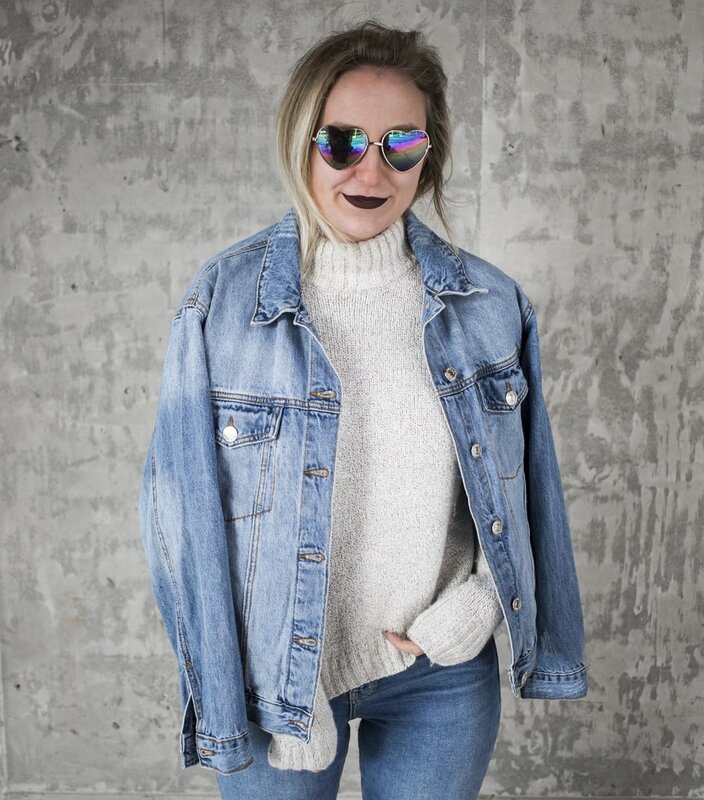 This sweater is on sale on my poshmark @rachelannabrown if you are interested! If you know me you know I am all into simple neutral toned wear, and I have become OBSESSED with Birkenstocks this year! I will be doing more outfits with Birkenstocks and how to style them in the winter, so stay tuned! Many of the items here can also be found in my LTK profile. Check it out!